An engraving, made by Blake himself, from an early edition of The Songs of Innocence and of Experience (1794). Blake’s “The Tyger” is a classic of British Romantic poetry, one we couldn’t resist branching out to explore for this week’s Tuesday Verse. The famous poem considers the tiger, an animal native to South and South-East Asia but which Blake may have seen at the travelling circuses that showcased the earth’s wonders to London’s paying customers. Blake’s poem marvels at the tiger, a sublime creature for its ability to excite both awe and terror. However, Blake is equally attracted to the shadowy figure who, hunched over his anvil, forges into being this majestic apex predator, as if from steel and fire. What kind of prime creator, Blake wonders, could have brought to life such a creature, perfect in its killing ability? Could such a figure have also created the lamb, the counterpart to the tiger in Blake’s myth whose life suggests both purity and the dangers awaiting it in a world of terrors? 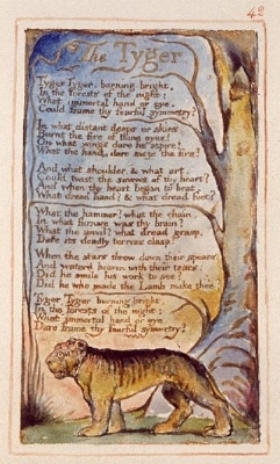 Blake’s poem doesn’t answer these questions on its own; rather, like many poems in The Songs of Innocence and of Experience, its interest is in framing competing ways of understanding the world and exploring the oppositions (tiger and lamb, experience and innocence) at the heart of human experience. Older PostP.B. 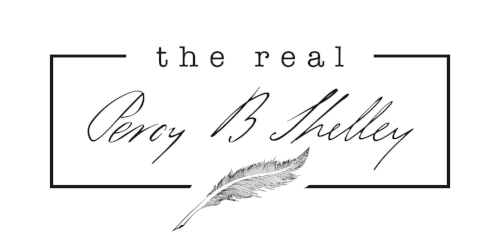 Shelley, "Sonnet: Ye Hasten to the Grave"